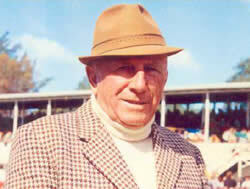 Started as a Trainer in 1932 and had immediate success, winning the Gift with Roy Barker. He followed this success up with further victories to Mal Durant 1958, John Bell 1963, Barry McLeod 1969 and Paul Young in 1985. A talent for bringing his athletes up to their peak for the Gift enabled him to train a record 5 Stawell Gift winners, as well as numerous other successes in other events.